EAST MADISON — A smoke detector chirped from the otherwise quiet woods Wednesday at East Madison Square Garden. 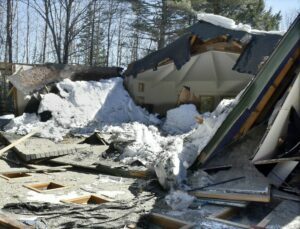 The sound was coming from inside the building, which for nearly three decades was home to live music, drama and dance and where sometime this winter the roof had collapsed under the weight of the snow load. 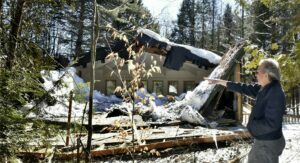 No one was there to see or hear it happen, but there it was Wednesday, the shingled roof and three walls sticking out of the snow like broken bones. 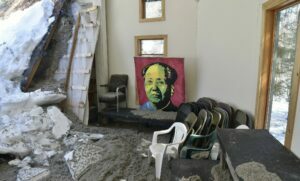 The building was insured, but it is uncertain to what extent the policy will cover the damage with the snow load not having been removed. Performances have included plays put on by local playwrights Anna Freeman and Bob Lovelace and live music from a younger generation including Clay Camero, So Many Chills and Uncle Spudd last summer. “The destruction of our wonderful East Madison Square Garden is a devastating loss,” Freeman said in an email Wednesday to the Morning Sentinel. “Incredible volunteer efforts over these many years went into constructing this building — a beautiful venue for all kinds of gatherings. Many of the original participants in the founding of East Madison Square Garden were post-hippie back-to-the-landers who had settled in West Athens, Bingham, Solon and East Madison. One of them was Richard Roberts, who for many years was the emcee for the play that followed the now-defunct West Athens Fourth of July parade. Roberts was at the site Wednesday, surveying the damage. 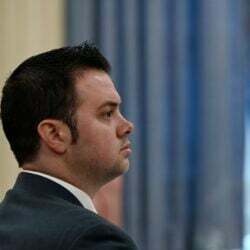 Roberts said it appears that the roof collapsed into the center of the building, bringing down the two side walls and flattening the front wall. 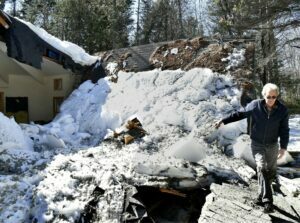 Three or 4 feet of frozen snow still clung to the rubble Wednesday. The 40-by-40-foot building is about 10 miles north of downtown Skowhegan, off Bagley Road and the dead-end Tupper Road. Some of the props remained Wednesday, buried amid the plywood and trusses that once held the Garden. The old light board that Brian Harville had made back in the 1970s for the Cornville Players was inside the building when the roof came down, Roberts said. 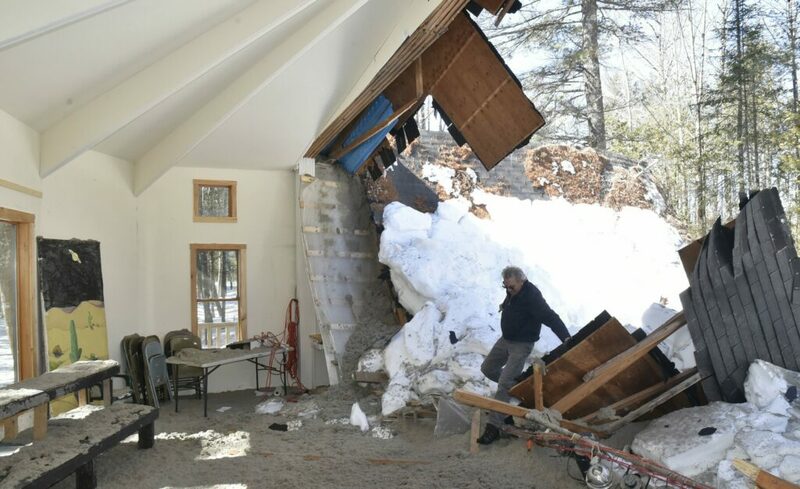 Roberts said the one concern came when the insurance adjuster asked if they had shoveled the roof at any time this past, very snowy and cold winter. East Madison Square Garden is a nonprofit organization, which this year will re-establish its 501(c) 3 status. As for what’s next, Roberts and Richmond said they will just have to wait until all the snow melts. They will probably salvage as much of the building materials as they can and look toward the future while waiting for word from the insurance carrier.